NEW YORK –(ENEWSPF)—April 3, 2017. Attorney General Eric T. Schneiderman, leading a state and municipal coalition, today announced that he is commencing legal action against the Trump Administration for violating federal law by delaying energy efficiency standards for several common consumer and commercial products – such as ceiling fans, portable air conditioners, walk-in coolers and freezers, commercial boilers, and more. The six standards being blocked by the Trump Administration offer dramatic air pollution reductions, as well as energy- and cost-savings to consumers and businesses. According to federal Department of Energy (“DOE”) estimates, the standards would combine to eliminate emissions of 292 million tons of the greenhouse gas carbon dioxide, 734 thousand tons of the pollution that creates soot and smog, 1.2 million tons of the potent climate change pollutant methane, and over 1,000 pounds of highly-toxic mercury, over a 30 year period. Over this same period, the Appliance Standard Awareness Project estimates that the efficiency standards would together save over 443 billion kilowatt-hours of electricity – the equivalent of the annual electricity consumption of over 36 million households. The DOE itself estimates that the six standards would provide net savings to consumers and businesses of approximately $23.8 billion. delaying the effective date of final energy efficiency standards for ceiling fans. stalling the final standards for compressors, walk-in coolers and freezers, power supply equipment, portable air conditioners, and commercial boilers, by failing to publish them in the Federal Register. 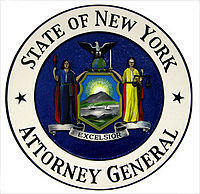 Joining Attorney General Schneiderman in the lawsuit regarding ceiling fans are the Attorneys General of the states of California, Connecticut, Illinois, Maine, Massachusetts, Oregon, Vermont, and Washington, as well as the Pennsylvania Department of Environmental Protection and the City of New York. The same coalition, plus the Attorney General of Maryland, are joining Attorney General Schneiderman in sending a 60-day notice regarding the other standards. Attorney General Schneiderman and the coalition charge that these delays are illegal, violating EPCA’s “anti-backsliding” provisions by effectively weakening the final standards published in January, and violating the APA by being undertaken without the public notice and comment required by law when substantive changes are made to published final rules. Accordingly, the coalition has filed a lawsuit in the Second Circuit Court of Appeals against the Trump DOE over its illegal delay of the effective date of the ceiling fan efficiency standards. The suit seeks a court order to require the standards to go into effect immediately. Click here to read the petition for review. Regarding energy efficiency standards for compressors, walk-in coolers and freezers, power supply equipment, portable air conditioners, and commercial boilers, DOE issued a “prepublication notice” of a final rule for compressors on December 5, 2016 and for the four other products on December 28, 2016. The posting of these five rules triggered a limited “error correction” period for the public to identify any typographical or numbering errors for correction by the Department. By law, DOE was then required to publish final energy efficiency standards for compressors by February 21, 2017 and for the four other products by March 15, 2017. To date, the DOE has not published any of these final standards. The coalition charges that the DOE’s failure to publish these five final energy efficiency standards violates EPCA’s standards setting deadline requirements. In accordance with requirements of EPCA, the coalition is sending a 60-day notice today to the DOE of its intention to sue the Department over these violations. If the Department fails to publish the five energy efficiency standards as final rules within 60 days, the coalition intends to file a lawsuit in U.S. District Court asking the court to declare that the DOE has failed to perform mandatory legal obligations, and require the Department to immediately publish the final rules. Click here to read the 60-day notice. This matter is being handled by Assistant Attorneys General Timothy Hoffman, Lisa S. Kwong, and Michael J. Myers, and Environmental Scientist Linda M. Wilson, of the New York Attorney General’s Environmental Protection Bureau. The Environmental Protection Bureau is led by Lemuel M. Srolovic and is part of the Division of Social Justice, which is led by Executive Deputy Attorney General for Social Justice Alvin Bragg.